Bulgur wheat adds fiber, and it tends to look like ground beef. As a result, this healthy vegetarian chili looks a lot like traditional chili. In a medium soup pot, heat oil on medium-high heat. Add the onion, bell peppers and garlic. Saute for about 5 minutes, stirring frequently. 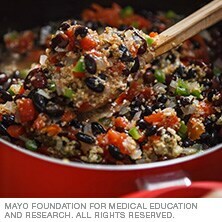 Add the water, bulgur, kidney beans, black beans, tomatoes, chili powder, oregano, cumin, garlic powder, onion powder, salt and cayenne pepper. Bring to a boil, stirring frequently. Boil for about 10 minutes. Reduce heat and simmer, uncovered, for about 10 minutes until the mixture thickens slightly as the water is absorbed into the bulgur.